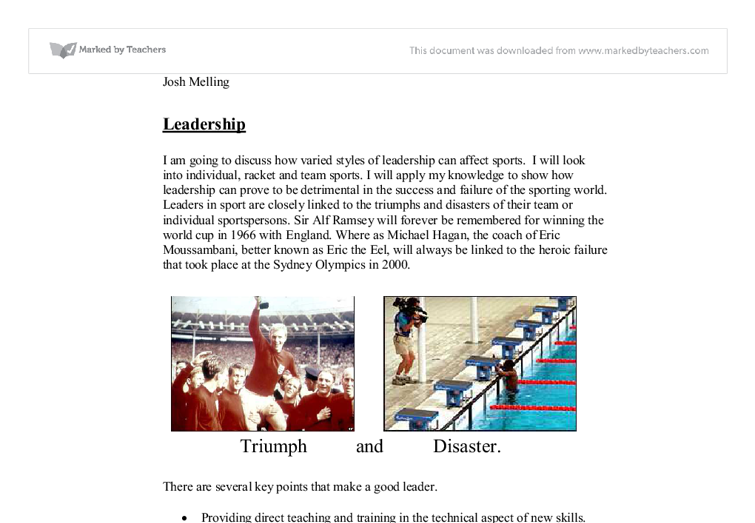 To investigate how varied types of leadership can affect sports performance. 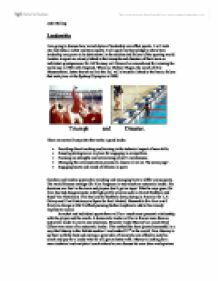 Leadership I am going to discuss how varied styles of leadership can affect sports. I will look into individual, racket and team sports. I will apply my knowledge to show how leadership can prove to be detrimental in the success and failure of the sporting world. Leaders in sport are closely linked to the triumphs and disasters of their team or individual sportspersons. Sir Alf Ramsey will forever be remembered for winning the world cup in 1966 with England. Where as Michael Hagan, the coach of Eric Moussambani, better known as Eric the Eel, will always be linked to the heroic failure that took place at the Sydney Olympics in 2000. Triumph and Disaster. There are several key points that make a good leader. * Providing direct teaching and training in the technical aspect of new skills. * Ensuring strategies are in place for engaging in competition. * Focusing on strengths and overcoming player's weaknesses. * Managing the communication process to ensure all are on 'the same page'. * Engaging hearts and minds of athletes in sport. Coaches and leaders approach to teaching and managing have to differ across sports. ...read more. For example in the 2006/07 season at Wigan Athletic Paul Jewell was the manager. Chris Hutchings was his assistant manager and Gary Walsh was the goalkeeping coach. A manager wouldn't know everything there is to know about every position so the club employs the coaching staff to help him out. In Dangerous sports such as Rock climbing you will need an autocratic leader. You will just have to listen to your leader and do what the he says in order to ensure your safety. The leader would have to be experienced and be trained to know what to do in an emergency. In Individual sports there can be a need for a laissez fair leader if the athlete is top class. In the case of Tiger Woods with 12 majors under his belt there is no need for him to acquire new skills. He already knows everything there is to know about the sport he just needs to continue to practice his swing and his short game to perfect it even more. Roger Federer is another example of an athlete who is at the top of his sport and only requires a laissez faire leader. ...read more. Timing in distance running is crucial and will be something that is worked on meticulously in training. Paula Radcliffe is one of Britain's finest athlete's. She is not renowned for her sprint finishes so it is important she breaks from the pack at the right time. Like all the others, on the day it is down to the athlete themselves to read the situation and act accordingly. Leadership can involve many different strategies. There is no right or wrong way to lead. It depends completely on individuals and teams involved. Some scenarios may require the leader to be harsh and on other occasions there may be the need for a more encouraging approach. Being a leader is by no means an easy task. Often the buck lies with them for poor performances of their players. But in my eyes I believe responsibility should lie with the leaders. At the end of the day it is them who are receiving money to get the best out of the athlete. If they fail to do so then another leader should be brought in. It is a passionate job that demands a desire and a winning mentality. The want to win is what drives the leaders on and why they put them selves through so much scrutiny with in the sporting world. ...read more. However, when I am the ball carrier in a two on one situation I often fail to make the correct decision and nearly always go to run the ball in myself to score the try, in the hope that I'll beat the defender or will be able to offload the ball to my teammate should I get tackled. - standing long jump, standing hop, and standing jump for height. Depth jumping (very high intensity) - jumps down and up on gym boxes (40-100cm), bounding up hill/steps to increase power in legs Basic gym activities were done this week. the player before shooting or just shoot and hope for the best. The free kicks were easy to arrange, the more talented players took them, there was a wall to beat and it was taken 22-25 yards out. The wall contained four players which made it very difficult for a player to score and not many did. and they realise you are a bit wary of what you are leading they will take advantage and the session and take things into their own hands, such as playing with equipment when they should be listening and not following all commands. arousal point, and enter the 'Zone' - where at which their perceptual field adjusts itself to its ideal, and the performer is able to focus upon the most relevant cues in their sport, and respond accordingly - performing at their best all of the time. Research into the effects on the different types of leadership on cohesion was carried out by Carron in 1988 and he found that a democratic style was more suited than that of an autocratic style, however it may be believed that a laissez faire approach may increase social cohesion but actually decrease task cohesion and therefore influence performance. ~The recovery of the racket should be a rebound on impact. Self-evaluation I found I did these quite well, my reason for thinking this is because my opponent couldn't return my hits. I did become better at these towards the end of the sessions because every week I would practise them.